Things went a little late at work on Friday and we spent the weekend painting so we celebrated our wine and cheese day on Sunday this week. 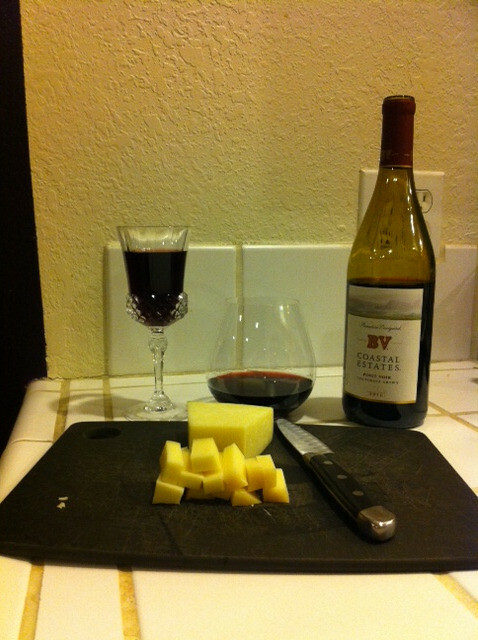 Neil loves Pinot Noir’s so we figured we’d give this pairing a try. What we found during those initial sips: Maria noticed the wine was a little thin and thought she smelled oak or smoke, while Neil noticed a spicy bite. One of the interesting things about the cheese this week was that it was our first cow milk cheese since we’ve started. After the cheese Neil tasted cherries in the wine. For Maria the cheese had a funky taste but she did feel the wine tasted fruitier. Upon conclusion Neil said “I could live in this wine!” and the cheese was way too pungent for Maria.